Fancy being Taoiseach Gerry? 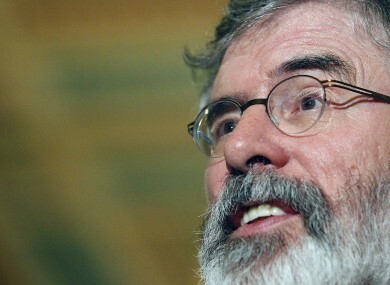 He "hasn't given it any thought"
The Sinn Féin leader says he’s focused on being a “good republican”. SINN FÉIN LEADER Gerry Adams says he has not considered the possibility of being Taoiseach after the next general election. Speaking on RTÉ’s This Week programme, Adams says he “hasn’t given any thought” to whether he would be Taoiseach if Sinn Féin emerged as the largest party in the Dáil. “I want to be the best republican that I can be, I want to be the best Sinn Féin member that I can be, the best activist, the best citizen,” he said. If that opportunity arises we will look at that, but we’re well out from the election and all the speculation about what parties may or may not form the next Government, a vote hasn’t even been cast. Pushed on whether Sinn Féin would have to water down some of policies upon entering government with another party, Adams acknowledged negotiations would take place. “I’m not against compromising but what I am against is what Labour did,” he said. Speaking earlier in the day on RTÉ’s This Week in Politics, Minster for Communications Alex White said Sinn Féin indeed have to make compromises if they went into Government. “All parties do,” he explained, rejecting accusations from Mary Lou Mc Donald that Labour had abandoned pre-election promises. We have had the backs of working people. We have maintained, and Joan Burton has maintained, social welfare rates. We have done a huge amount of work to ensure that the most vulnerable in society are the least impacted by what has had to happen in order to actually have an economy, to save the economy from the ruin that it was essentially in. Asked if there were was dispute within her party about whether they should go into Government, McDonald acknowledged that there were differing views but argued that they did not want to sit on the sidelines. “We’re anxious to have the opportunity to take that challenge and to make that, as you say, difficult decision,” she said. Email “Fancy being Taoiseach Gerry? He "hasn't given it any thought"”. Feedback on “Fancy being Taoiseach Gerry? He "hasn't given it any thought"”.